A presentation on a unique usage of 3D printers was given by Yasusi Kanada (the CTO of Dasyn.com) in the IPSJ Summer Programming Symposium 2014 (originally in Japanese but available in English too). The presentation title was ““3D Turtle Graphics” by 3D Printers”. Turtle graphics is a method of creating (usually) two-dimentional graphics by writing a polygonal line using "turtle". 3D turtle graphics is an extension to generate 3D graphics by a similar method. The proposed method is to generate a 3D printed object by using the method of 3D turtle graphics. In this presentation, a video on 3D turtle graphics, which was uploaded to YouTube, was shown and the technology was explained. Three short videos on new methods of 3D printing are uploaded to YouTube. 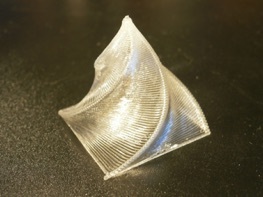 Two of these methods enabled printing thin dishes, spheres, pods, wine glasses, and so on by helical head motion (Printing a dish by helical 3D-printing method and Printing a sphere by helical head motion). By using transparent PLA filament, this method can generate brilliant dishes and other types of objects. The other method enabled “3D turtle graphics” using 3D printers ("3D turtle graphics" by 3D printers). A flying “turtle” generates 3D line arts. These methods will be demonstrated in the Maker Faire Tokyo 2014. The second method will be introduced by a presentation titled ““3D Turtle Graphics” by 3D Printers” in the IPSJ summer programming symposium 2014. The slides and paper will be available from this page. The first method was briefly introduced in a presentation in the BIT 3D congress, and the detail will be published soon.